She's crazy about books and if she could have her way, everybody else would be, too. Especially the youth. "I desperately want children to visit the Miniature Book Museum and get interested in books," says Zarifa Salahova, founder and curator of the world's only private museum featuring these tiny printed volumes. "Our young people should develop a passion for reading. Textbooks at school and at the university are not sufficient for life; they should develop a deep thirst for knowledge by reading on their own." During the last 20 years, despite the severe restrictions that Soviet authorities placed on international travel and communications when she first started pursuing her passion for collecting, Zarifa Salahova has managed to collect more than 4,300 miniature books. 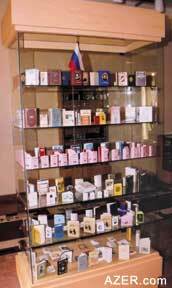 More than 3,600 are now on display at the Miniature Book Museum that opened its doors, appropriately enough, on International Book and Copyrights Day - April 23, 2002. Left: Inside view of the Miniature Book Museum. To her credit, many of these tiny volumes have not been bought. They are the results of years and years of gift-giving and exchanges from friends. Behind every book is a story of how it came to be part of Zarifa's collection that is now housed under one roof in the Old City (Ichari Shahar) of Baku. Zarifa prides herself with the international scope of her collection which represents 47 countries and numerous languages including Azeri, Russian, English, French, German, Spanish, Italian, Finnish, Hungarian, Polish, Vietnamese and others. To her knowledge, there are no other miniature museums in the world. She knows of only one. It's not a private undertaking, like hers, but rather it is sponsored by the city of Gorlovko in Ukraine. 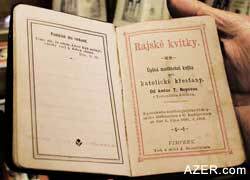 Venyamin Alexandrovich Razumov, whom Zarifa knew personally, had been collecting miniature books since the 1940s. When he died in 2001, he presented his collection of 7,000 books to the city to create a museum. Zarifa's passion for reading started early in childhood. Her three older brothers - Sabir, Mahir and Tahir (the famous artist) - were all avid readers. After reading the books that they got from the library and from friends, they would pass them on to her. She was the end of the line. Since there weren't as many distractions that competed for young people's time back then, many youth indulged in reading. It was a small book, not even what could be classified as a miniature, that captured Zarifa's imagination and set her on the trail to become an avid collector. Ivan Krilov's famous book of animal tales in Russian was the initial volume. She discovered it while browsing in a bookstore in Moscow one day. 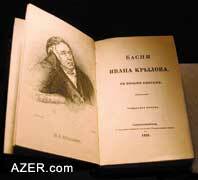 The original Krilov was published in 1837; the one Zarifa found was a reprint from 1982. Actually, she'll even admit that the Krilov is her favorite, though she loves them all "like a child". Also, one of the miniature Korans of the 19th century is especially dear to her, because an old lady from one of the villages on the outskirts of Baku gave it to her. But it's not just content that has attracted the museum creator's attention; it's the craftsmanship and the charm of holding these tiny volumes in your hand, and being able to tuck them into your pocket or purse and read them at your convenience wherever you go. Below: (Left) One of the miniature Korans in Museum. Right: Nasimi, classic Azerbaijani poet, printed in the Russian language during the Soviet period so they could enjoy wider distributed throughout the Soviet Union. Miniature books fall into four categories, according to size: Macro-Mini: 3-4 inches, Miniature: 1-3 inches, Micro-Mini: 1/4-1 inch, and Ultra Micro-Mini: less than 1/4 inch. The earliest miniature books date from the Middle Ages - one of a kind that were hand-written, illuminated manuscripts - devotionals and Bibles used by royalty. The first miniature book ever to be printed was "Diurnale Moguntinum", a pocket-sized volume printed in 1468 by Peter Schoffer, the assistant and successor to Johann Gutenberg. Below: (Left) Rajske Kvitky, one of the religious books in the Museum. 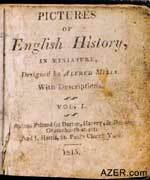 Right: Oldest printed miniature in Museum: "Pictures of English History", 1815. The nature of these tiny volumes, then and still tends to be, gems of abbreviated truth - philosophical, poetical, political, religious and inspiration. But, today they can cover an array of topics from literature to cookery, from history to science. Their formats are equally rich in variety, from traditional letterpress to cutting-edge computer technology, to elaborate pop-ups with hundreds of intricate pieces. Left: Exhibit case totally dedicated to miniature books about Russian poet Alexander Pushkin and his works. The Museum has 320 books related to Pushkin. Bindings are equally varied, from traditional leathers and marbled papers to snakeskin, wood, and silver. Some are housed in intricate boxes with elaborate clasps and moving parts. Although the format is small, it lends itself to an astonishing array of presentations, and the result truly reflects the art of the book. Miniature books gained great popularity in the 17th and 18th century, especially in Europe. And today there are many Miniature Book clubs, including the International Miniature Book Society which can be accessed on the Internet. Among the greatest collectors are the Japanese who boast the only exclusive bookstore selling only miniatures. The shop is called "Lilliput" after the little people described in "Gulliver's Travels" by17th century Dublin satirist Jonathan Swift. The museum is divided into 15 sections with 25 exhibition cases. The categories include: (1) Azerbaijani authors, (2) Oldest, (3) Smallest, (4) Children's, (5) Soviet era, (6) Pushkin, (7) Baltic countries; (8) Central Asia; and (9) International. This section especially features miniatures of classical literature published by "Yazichi" (Writer) during the Soviet period. It includes authors such as: Ashug Alasgar, Nizami, Nasimi, Khagani, Vagif, Akhundov, Sabir, Natavan. These were published in the Russian language to encourage distribution beyond Azerbaijan to other Soviet republics. Also, the museum has a copy of "Heydar Aliyev, Soviet Azerbaijan," published on the occasion of the 70th Jubilee of the Soviet Azerbaijan, when the [third] Constitution was adopted in 1978. The oldest volume in the museum is a copy of the Koran dating to the 17th century. Other early miniatures include: "The History of England", London: 1815. There is also a set of five volumes in French entitled, "The Adventure of Young Lavilas in Greece", published from 1817. Zarifa bought the set at an antique shop when she was in Paris. A copy of La Fontaine's Fables, published in Paris dates to 1850. Also there is a volume which contains a poem called "Ashug Garib" written by Lermontov and published in Kharkov (Ukraine) in 1892. There is also a miniature called "The Biography of M.Y. Lermontov," one of the leading Russian Romantic poet (Kiev-Kharkov, 1893). Above: (Left) The world's Tiniest miniatures, Japan. Inside the circular white containerare three books: 2mm x 2mm each. It is possible to read the text if viewed under a magnifying glass. Right: Fables by Krilov, Russian Poet. 1835. This is the first book that Zarifa Salahova ever owned. She cherishes it the most since it has led her on this fascinating journey of collecting miniatures. The Japanese are credited with having produced the smallest miniatures with legitimate readable text (under a magnifying glass). Measuring 2mm x 2mm, they look like tiny specks on your fingernail. The museum has three of them: "Language of Flowers", "Birthstone", and "The Signs of the Zodiac" (Tokyo: Toppan Publishing House, 1978). The smallest miniature (6mm x 9mm) published in the former USSR is called, "The Most Miraculous Thing" (Moscow, 1985) and includes selections from the works of Alexander Pushkin and Maxim Gorky which are translated into five languages - Russian, English, Italian, French and German. Above: (Left) "Heydar Aliyev. The Contract of the Century"
Right: "Oil Policy of Azerbaijan". Baku: 1998. In Moscow, during Soviet period (1920-1991), there were two major publishers of miniature books; Izdatelstvo Kniga (Book Publishers) and Izdatelstvo Khudojestvennoy Literaturi (Fiction Publishers). A club of miniature book lovers was established which met twice a month in Moscow. Soviet miniatures propound political ideology. For example, there are constitutions of the former USSR and its republics, including Azerbaijan's in 1978. The majority of Soviet books, naturally, relate to Lenin. Two books relate to Stalin: "The Results of the First Five Years" (1933), and "Orders of the Supreme Commander-in-Chief" (1943) which was distributed among the soldiers who carried them during the "Great Patriotic War" (World War II). A separate showcase displays the books that are related to the International Communist Movement leaders, such as Marx, Engels, Lenin, Breschnev, Andropov, Titov, Georgy Dmitrov, and speeches of others Communist Party leaders. There are also two separate showcases that display more than 320 books about Alexander Pushkin and his works. UNESCO declared 1999 as the 200th Jubilee for Pushkin and as a result, many books were published all over the world for this occasion. The museum has several of Pushkin's works here, such as "Evgeniy Onegin", which was published in 1837 when Pushkin was still alive. Then there are miniatures of "The Queen of Spades" and "Stories of Belkin". The museum also has a very small book of Pushkin's poems devoted to the city of Moscow. 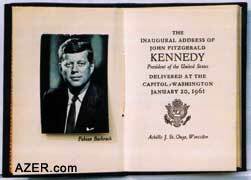 One of the prized volumes in the museum is "The Inaugural Address of John Fitzgerald Kennedy, President of the United States which was delivered at the Capitol in Washington D.C. on January 20, 1961. There are also literary works by British and American authors such as Shakespeare, Bobby Burns, Conan Doyle, Jack London, Edgar Allan Poe, Hemingway, O'Henry and others. 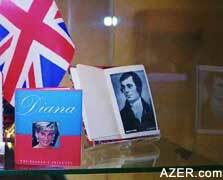 A recently published miniature of Princess Di is also adorns the collection. Above: (Left) UK: Princess Di and beloved poet Bobby Burns. Right: Inaugural Address of John Kennedy, President of the United States, January 20, 1961. Salahova herself has also published a few miniatures. 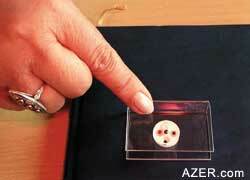 For example, she organized the first miniature (5mm x 7mm) related to the presidency of Heydar Aliyev. It was entitled, "The Inaugural Speech of the President of the Azerbaijan Republic" (Vow of Fidelity to the Country, State and People) and commemorates the occasion when Heydar Aliyev took office on October 10, 1993 at the Republic Palace. The text is in Russian and English (reverse direction). Baku: 1995 (limited edition of 500 copies). In 1996, she published the new Constitution of the Azerbaijan Republic [the fourth in Azerbaijan's history] to commemorate Parliament's ratification of the document in late 1995. Though published after Azerbaijan had gained its independence, the text is in Cyrillic, just as most publications were during that transition period. Although the Latin Alphabet was adopted in 1991, a few weeks after the collapse of the Soviet Union, it took President Aliyev's decree 10 years later in August 2001 before all official documents, books and signage written in Azeri started to be printed in the Latin script. The third miniature that she has organized was President Heydar Aliyev's speech on September 20, 1994, on the occasion of the signing of the "Contract of the Century" when 11 international oil companies established a consortium for the development of oil in the Azeri-Chirag-Gunash oil project. 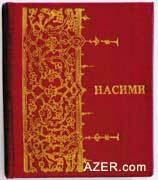 This leather-bound, gilt-edged miniature (4.5mm x 5.75mm) was published on the occasion of President Aliyev's 75th Jubilee in 1998. The presentation of this volume took place in the Akhundov Library. Salahova organized an exhibition of 2,000 miniature in conjunction for the occasion. Presently, there are no miniature books for sale at the museum. However, if you bring copies of miniature books that the Museum doesn't have, they'll gladly exchange them for some of those described above which she herself has published. 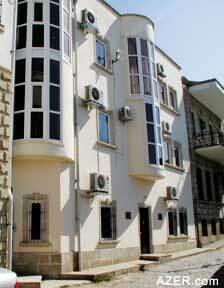 The Museum is located in the Old City (Ichari Shahar) at 1 Gala Street near the Shirvanshah Palace. Hours: 10 a.m. to 5 p.m., Closed: Monday and Thursday. Admission: Free. 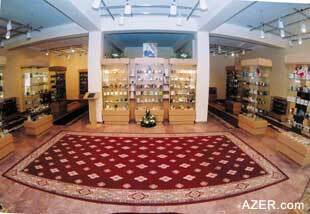 Suad Aladdin, the daughter of Zarifa Salahova, is the Museum Director.